Not to generate economic gains (they do, but as a byproduct), or provide a home to the arts, entertainment or learning (again, byproducts), and certainly not to support a government (it’s a means to an end). I would argue that the real purpose of cities is to create a group of people who will take responsibility for their community. And it’s this willingness to accept responsibility that is the difference between a resident and a citizen. I’m convinced if we could continuously widen the circle of people willing to take responsibility, we’d have happier, stronger communities and solve our most important civic problems. But before you sign on to my idea, consider the other side of that proposition: Why would busy adults willingly take on more responsibilities? Do they have time to spare for civic work? And if they had the time, how could we marshal their talents? The answers I’ll offer come from my own experiences and from the frontiers of social research. I’ve been involved professionally in community decision-making and leadership development for nearly 20 years. Over those years, I’ve facilitated hundreds of meetings, from small groups of five or six to public sessions with hundreds of people in an auditorium. I’ve managed meetings with poor people who came because they feared losing a bus route, and weekend retreats where corporate CEOs worked on economic development issues. Again and again, I’ve been impressed by how much time people are willing to devote to these meetings, from CEOs to worried bus riders. I’ve also been struck by how seriously they take the work, which involves difficult issues of hope, scarcity and fairness. This isn’t fun stuff; it requires listening, understanding, searching for common ground and some degree of optimism and persistence. So why are people willing to do this? Because, I think, community work exercises intellectual muscles that are rarely used otherwise. It allows us to use our talents and life experiences in thinking about important issues as we learn about the experiences of others. And something else: It expands our connectedness. It is the most basic human instinct to seek connections with others. We’ve done this since we were children, in school yards, college dorms, workplaces, associations, religious institutions and clubs. Because of where we live and work, most of our connections end up being with people like ourselves. Community work – particularly when it stretches across an entire city – introduces us to those who are decidedly unlike us, and for many people it’s a profound experience. For the first time, they have a glimpse of what it’s like in other families, other neighborhoods, other lifestyles and other ethnic groups. And they never view things in quite the same way again. When they try it, then, people recognize that community work is good for them – it makes them more complete and empathetic human beings – and they like it, for all its difficulties and frustrations. But it’s also time consuming, so how do people find the time for community work? Here’s where the social research comes in. 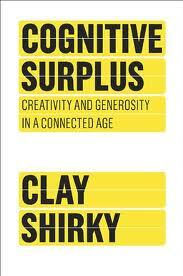 In his new book, “Cognitive Surplus: Creativity and Generosity in a Connected Age,” Clay Shirky, a professor at New York University, says we only perceive ourselves as busier than ever. In fact, he says, free time is growing, particularly among the most educated people. In the United States today, Shirky writes, the cumulative free time of our 233 million adults adds up to billions of hours each year. What we’ve done with that time, alas, is spend it watching television. “ . . . (I)n the space of a generation,” he writes, “watching television became a part-time job for every citizens in the developed world.” The average American now spends 20 hours a week in front of a TV. But there’s encouraging news here, Shriky writes. TV is losing its grip. “. . . (F)or the first time in the history of television, cohorts of young people are watching less television than their elders,” he says. And it’s not just young people. According to a survey by Forrester Research, adults of all ages now spend as much time on the Internet as they do in front of TVs. And while this doesn’t sound like good news – YouTube can be as much of a time waster as sitcoms – there’s a difference between the passive world of television and the potentially active world of the Internet, Shriky writes. On the Internet, you don’t have to be a consumer, you can also be a producer. That’s how Wikipedia came to be. The most successful and comprehensive encyclopedia ever made (the English language sections alone have more than 3 million entries) was built entirely by volunteer contributors. Shirky estimates that, in its first seven years, 100 million hours of volunteer labor went into Wikipedia – writing, editing and correcting articles, supplying links and illustrations and so on. At the same time, Shirky goes on, the Internet is lowering the cost of organizing people. (For more on this, see Shirky’s earlier book, “Here Comes Everybody”.) Again, Wikipedia is an example; in no other age could thousands of people all over the world be marshaled to give their time and talents to such an undertaking. Ultimately, though, we may find that the greatest potential for Internet-assisted involvement is in communities, where people can learn about issues on the Internet, get organized, raise money and volunteer their time online, and then meet face to face to do the work. It’s the perfect marriage of Internet efficiency and low cost with the connectedness and concreteness of community work. 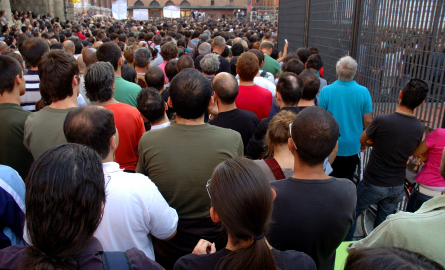 The potential for Internet-assisted community organizing is almost limitless. I’m convinced it will be a major part of how cities will widen the circle of responsibility in the future, and in doing so create the citizens we’ll need for our communities to be successful.